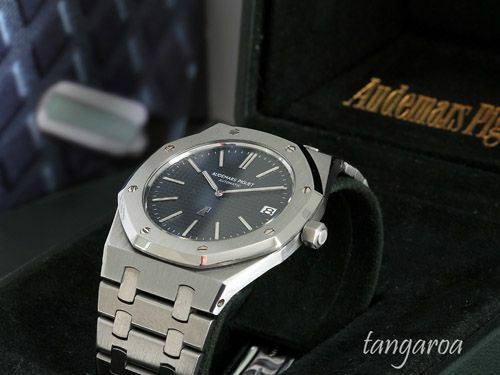 The original Royal Oak ‘Jumbo’ ref.5402 is being offered for sale by a member of the TimeZone community by the name of Tangaroa. 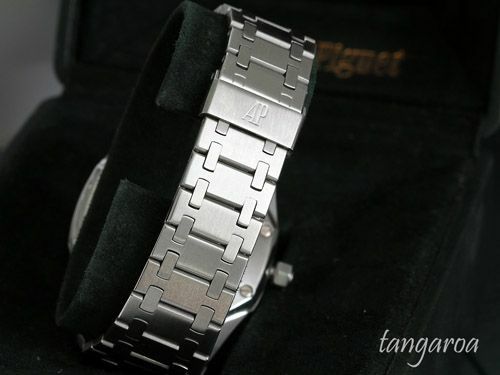 He is the second owner of this watch and it comes complete with box, original warranty papers and even with the original receipt of the first owner. For the same (retail) price of the current Royal Oak ‘Jumbo’ (not to be confused with the ref.15300) ref.15202ST, this vintage beauty can be yours. Specifications of the movement are the same as the current model ‘Jumbo’, the difference is mainly in the details. A ‘clou de Paris’-dial with a very fine hobnail, where the AP logo is located at 6 o’clock instead of 12 o’clock is a highly sought-after version by Royal Oak aficionados. With a price tag of £14865, I admit that this watch doesn’t come cheap, but then again, it is a rare find and only few have been made. This first reference also featured the most beautiful (non complicated) automatic movement, the AP cal.2121 (based on Jaeger’s 920 caliber). In my humble opinion that is. My guess is that the crown has been replaced during a service. On the other hand, a crown has a limited lifetime due to the seal inside. Ben of Hodinkee wrote an excellent article on the Royal Oak ‘Jumbo’ history for TimeZone which can be found here. More information on this particular watch can be found here.